Note: As of 2014, this page is no longer being updated. If anything changes it will be updated here. 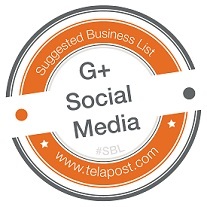 Welcome to Telapost’s Google Plus Suggested Business List (SBL). Len, the owner of Telapost, first started making lists in the early 1990’s. His very first list was called “The List”, which was a list of all BBS’s in upstate New York. Initially it was distributed on paper printed on a dot matrix printer at the local library (SneakerNet anyone?). It went on to become a monthly digital publication distributed by nearly every BBS in Central New York. Our Google+ Suggested Business List exists to highlight businesses utilizing the Google+ platform. Any business owner should be able to glance at this list and see how other companies are using Google+. As companies realize how much they need G+ and it’s SEO value, we expect that we’ll eventually be unable to keep up with all of the businesses jumping on board. The idea stemmed from the Google+ Suggested User List (SUL)- Google+ runs a SUL and many users started their own SULs to either promote their friends or sometimes new users to the platform. Nobody was running an SBL, so Len started one. NFL It is #SuperBowl week! My favorite part about the superbowl is the creative marketing that takes place during it. I can’t wait to see how the TV commercials play out and how any events could affect social media. Oreo “won the superbowl” during the brownout in 2013 if you ask me. That reminds me, where is Oreo on Google+?! I don’t see them anywhere. Hmm.. Anyways, the NFL has an active G+ page with almost 2mil followers. If you want to see NFL updates in your G+ stream, circle them up! Added 1/27/2014. Duke University now has more people circling them on Google+ than they have liking them on Facebook. It is great to see a university leading in social media. This article talks about how they now have the most followers on Google+: http://goo.gl/bYQLda. Duke interacts on their Google+ page, Google+ community, posts things, uploads many pictures, has a YouTube channel, and uses Hangouts to meet students! Is this the end of driving all over the country to interview? You may also want to check out their other social profiles: YouTube.com/user/Duke, Instagram.com/dukeuniversity, twitter.com/DukeU and facebook.com/DukeUniv. Added 1/21/2014. Lowry Porter Ophthalmology is owned by +Isaac Porter, MD. He is using Google+ “right”. Sometimes the best creators of content and marketers are the business owners and professionals themselves; they are the one with the passion and knowledge. Dr. Porter gets it and is building his brand. You can catch his YouTube show A State of Sight on his YouTube Channel here: http://www.youtube.com/user/eyePorter. The brand page +Lowry Porter Ophthalmology is building a presence for itself on Google+ and engages. Dr. Porter also uses Google+ Communities to discuss challenges and new procedures with other eye doctors and to learn about health care marketing. These tools are right here for anyone to use and it is great to see some people leveraging them. https://plus.google.com/102132013544605066713/posts/hpm3EyNseGp. Regardless of what type of business you have, using Google+ as a business is key. Added 1/8/2014. Gutter Glove North Carolina I never knew Gutter guards were really “a thing” until I owned my first home near some large trees. My friend +Ricky Stroup owns this business and has shown me things you wouldn’t believe, from attic mold, damaged foundations and more all caused by water damage from clogged gutters. I put together this article for them called “Do gutter guards really work?” just because I was so impressed: http://www.gg-nc.com/gutter-guards-work/. They have also done such an awesome job in 2013 they received and Angie’s List Super Service Award. The only way to receive one of these is to have very happy customers. Due to their ecstatic customers I am suggesting them here. They have also been dabbling in Google+ a little bit – their page and website are verified, they have some YouTube videos, are doing HOAs, and posting some content so check them out! Added 1/7/2014. Sauber F1 Team has put together a great list of resources. They are working to stay active on G+, have built a significant following, have a very large F1 community on Google+. They’re also promoting their Google+ presence on Facebook! I am thrilled that they are on here. It is good to see some companies getting it. Having a FB presence can work, but showing up in search and using a superior platform is always a good idea, too. This post shows their list of resources and explains how they are trying to pull their Facebook fans over to Google+. If you would like to see a page that engages, responds to people, uses communities, HOAs, YouTube, pictures and more, look no further. Added 1/5/2014. Reform Government Surveillance Coalition. Today my Suggested Business isn’t really a business, it is the Reform Government Surveillance Coalition. The coalition consists of Google, Twitter, Microsoft, Facebook, LinkedIn, Yahoo, AOL, and Apple. Together they call for security of user’s data, government transparency, and an end to untrustworthy, unchecked, wholesale data collection. On the Reform Government Surveillance website, they have laid out 5 principals and written an open letter to Washington. To see this website visit http://ReformGovernmentSurveillance.com Added 12/10/2013. NCBeerGuys You’ve got to catch their Beer Buzz! They produce YouTube episodes called the NC Beer Buzz. They highlight NC breweries and promote keeping your beer dollars in North Carolina. Like many businesses on Google+ they could use some more engagement, so hopefully they’ll pick up a follower or two from this. If you like craft beer, or want some great ideas on how to make decent YouTube videos, you need to check out the NC Beer Guys. Added 12/17/2013. Cadbury UK has embraced Google+ 100%. Any small business could get ideas from them by following them. They are constantly putting out new content, pictures, ideas, recipes, and more. They have a community with 80,000 people in it. They have 3mil+ followers. They offer sneak peaks at new products. HOAs, YouTube videos, Events, cover page updates, etc are all utilized. To top it all off, they sell chocolate! The cocoa beans used in their products are fairtrade which is important. They’ll also be one of the very first brands using +Post Ads, so they are absolutely a company to keep track of on Google+. Added 12/11/2013. Pittsboro Roadhouse and General Store I had the opportunity to go here last night. This business is a staple in the community. They’re normally closed on Sundays but yesterday they hosted their annual Community Christmas Party which was very nice, and completely free of charge. Unbelievable. Their G+ page needs a tiny bit of help but their presence online exceeds almost everyone’s in this small town. Their page does featureGoogle Maps Business Photos (a virtual tour – like street view inside of the business) so you can take a look around this place right from your computer chair if you’d like! If you pass through this town and are hungry, stop by and dine at this must see restaurant. Added 12/09/2013. Law Offices of David Azizi is doing it right. They’re active on Google+, engaging with other firms and users with the same interests that they have, and sharing some really neat maps. I am constantly crossing paths with them. They add photography, share people’s posts, engage with posts, are involved in communities, post YouTube videos, are involved in Hangouts, the list goes on. It is good to see a business that is utilizing the tools which G+ gave to them. Durham Spirits Co. I had the opportunity to go here last night and take some culinary & mixology classes thanks to +Google Local Triangle & #GoogleCityExperts . This place is legit! Check them out! Their G+ page could use a little content but it does feature Google Maps Business Photos (a virtual tour – like street view inside of the business). If you have never seen a Business Photos virtual tour take a look as this is a very cool business. Added 12/5/2013. Ferrari Ferrari has utilized Google+ to share lots of content, YouTube videos, create events, and more. And besides, they’re awesome. It is good to see that Ferrari gets it. They currently have over 4 million followers on Google+. Verizon Wireless They are not that active on Google+ at this time, but I selected them because they had the first ever “tech shoppable Hangout” as they hosted live demos on 2013’s hottest mobile accessories, including the Orbotix Sphero 2.0 and the GoPro Hero 3+ Silver Edition. The hangout is available to view here: http://www.youtube.com/watch?v=Rnv0vBXZ-cM. Added 12/2/2013. Giving Tuesday Dec 3, 2013 The accepted donations via a 12 hour long, interesting Google Hangout. From the initial article: “The Hangout-a-thon is a phoneathon for the connected generation of the 21st century. It will feature 12 hours of thought-provoking guests, who will share updates on some of the most disruptive non-profits working today. The best part is, if you like what you hear, you can take action right on the spot by donating to the project through the Google+ Hangout.” This was the first Google+ Hangout-a-thon for charity and was hosted by Mashable and Google+. Giving Tuesday also comes up with their own hashtags, most notably #GivingTuesday. Added 12/2/2013. Google Giving. I thought it was fitting, being so close to Thanksgiving and all. If you haven’t bumped into Google Giving, check them out. From their site “Tech entrepreneurs are using innovation to tackle some of the world’s biggest challenges. We invest in teams with bold ideas that create lasting global impact.” Added 11/29/2013. The Mast Farm Inn. Open since the 1800s, this business is on The National Register of Historic Places. They are also now involved in Google+. I cross paths with them several times each week. They’re located in one of my favorite parts of North Carolina, Banner Elk. If you like their Google+ presence, be sure to check them out on Pinterest and other social media platforms as well. They use Google+ to post blog content onto their page, they manage and actively participate in several Google+ communities, engage as a business, and more. This company is awesome at social media. Added 11/26/2013. T-Mobile. I am thrilled that T-Mobile uses Google+ for engaging. You can see what it did for this business in this post (http://goo.gl/6T4PyU), where they replied to a post of mine which went viral and they received 50+ +1s rapidly. Who gets 50+ +1s n a comment? T-Mobile does. They jumped into the conversation minutes after it started, and the timing was everything. T-Mobile is a great example of a brand using Google+ for engaging. Added 11.25/2013.